It just recently turned cold out, which means I’ve started daydreaming about next year’s garden. I am a native plant enthusiast, and I have decided that I’ll be planting a prairie garden filled with my favorite flowers that I’ve learned with The Nature Conservancy in Nebraska over the past six months. I’ve poured through the internet searching for propagation information and bloom times. I want to make sure I have a continuous bloom period, both because it makes for pleasant viewing and because I want to provide native bee habitat across the growing season. 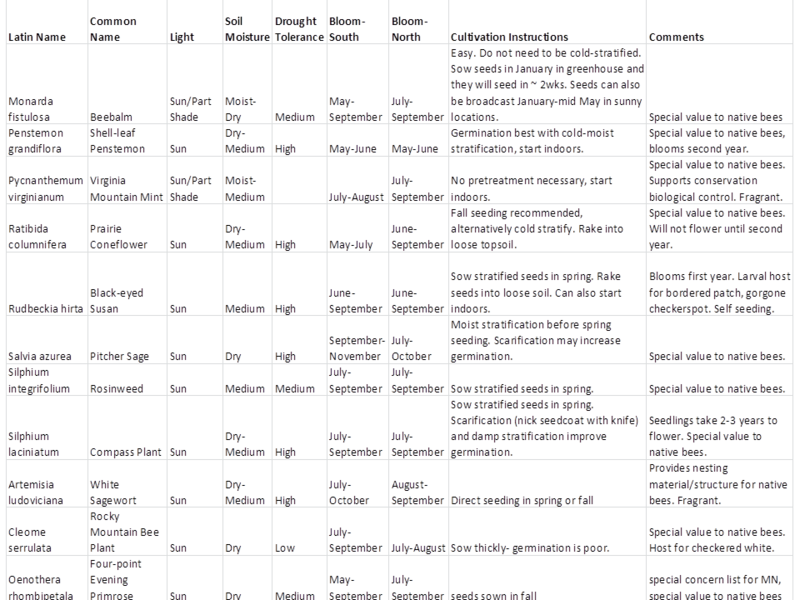 I also need to know which seeds require stratification or scarification. 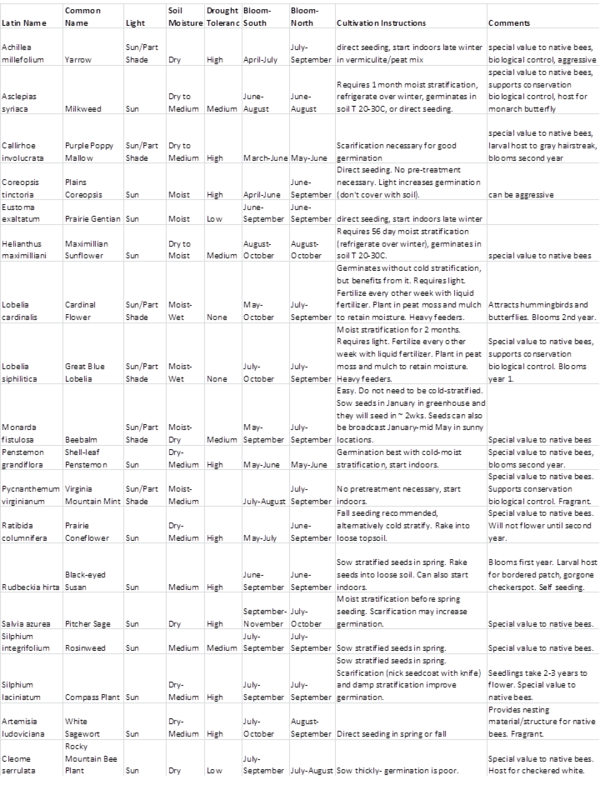 Because I am me, I made a spreadsheet of all this information (at the bottom of this post). Who wouldn’t want flowers like this in a garden? 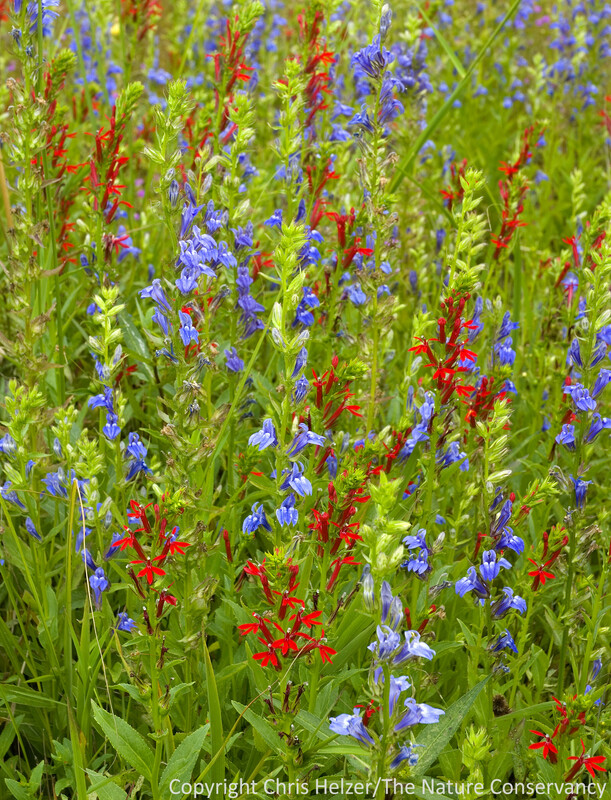 Blue lobelia and cardinal flower in The Nature Conservancy’s Platte River Prairies. Ultimately, I want my garden to be a great pollinator resource filled with unique native plants. If it attracts birds and butterflies too, that’s a huge plus. Lastly, if it’s going to survive my schedule, it needs to be low-maintenance. I am pleased to note that gardening with native plants can fulfil all these objectives. My table of appealing native plants, though not comprehensive, will help me design my garden to satisfy these requirements. I’d love to hear everyone’s thoughts on favorite native plants and propagation tricks. Click on the tables below to see a larger/clearer version of them. Or click HERE to see the same information in a PDF format. 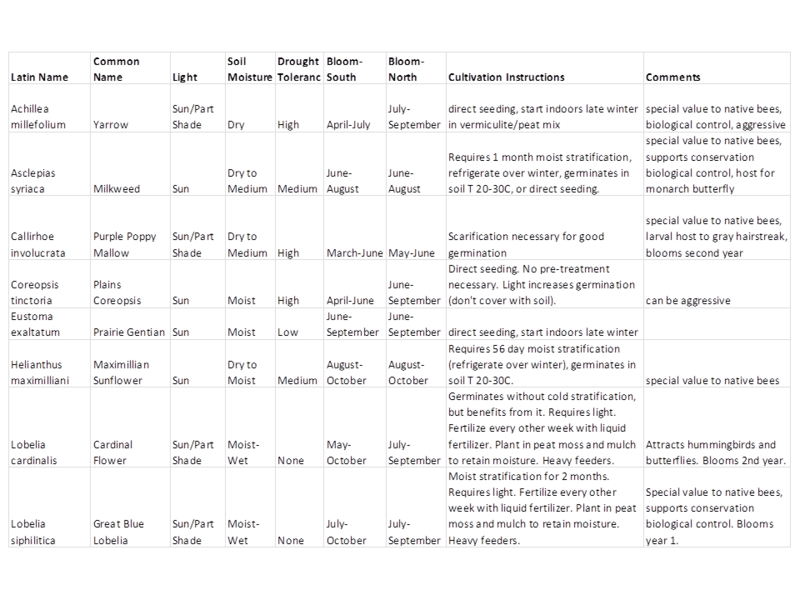 *Information on propagation, soil moisture requirements, and bloom period gathered from the USDA Plants Database, http://www.wildflower.org/plants Native Plant Database, and the Missouri Botanical Garden Plantfinder Database.